Updated 9/24/2017 Miyako keeps the medal as a treasure, but a demon finds it and possesses it, forcing Maron to steal it in her Kaitou-Jeanne form. In so doing, she has to keep from physically harming her friend, and the demon, sensing this weakness, presses her hard. This pause in the action lets the magical thief catch her breath in a dramatic and realistic way. 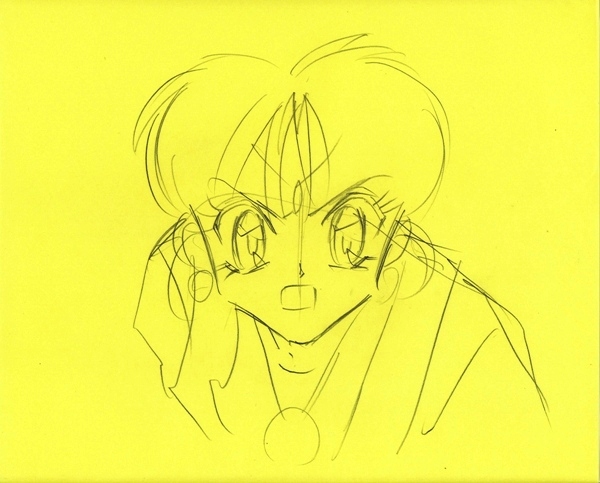 The rather preliminary rough featured above is likely by the episode’s animation director, Masami Suda. He has been a workhorse for Toei, contributing to a wide variety of their projects, including Dr. Slump, Dragon Ball Z, Pokemon, Legend of the Galactic Heroes, and Cutey Honey. Suda is best known as the character designer for the action series Hotoko no Ken/Fist of the North Star, for he also did animation direction. More recent projects include Hellsing Ultimate and Hell Teacher Nube. Certainly the combat scenes between Jeanne and the demon-of-the-week are the most compelling part of the episode.